The Sanders Watney Trust was created in 1986 as Registered Charity No. 327023 and named in honour of former British Driving Society President, Mr. Sanders Watney. Since 1995, loans totalling more than £23,000 have been made to 46 RDA groups. Of this money, 82% has so far been repaid and loaned again. 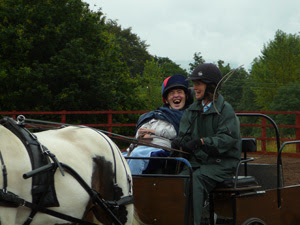 The driving movement for people with disabilities has come a long way since HRH Prince Philip suggested in 1974 that carriage driving might be a suitable activity for people with disabilities. A growing number of drivers are keen to compete; some of whom now have the ability to do so at the International sport levels. This is tremendous encouragement to those who are just starting out. The courage and skill of those at the top has proven a real catalyst towards continued progress. Standards have risen, yet the element of fun at grass roots remains.